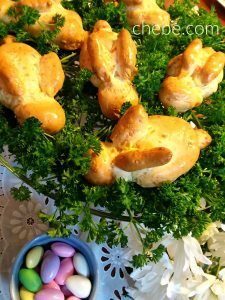 Young and old will laugh in delight with the surprise of Easter Bunny Bread at the table. And their taste buds will be equally excited! Also, since Chēbē is naturally gluten and grain free, no one need give thought to those pesky allergens while enjoying this tasty treat. 4 Tbsp milk milk substitute or water. 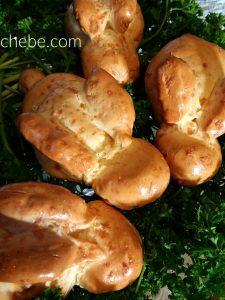 Using a fork, blend Chebe Bread Mix with other ingredients (reserving an egg for the egg wash). 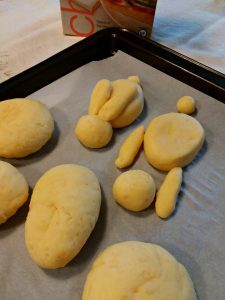 Divide dough into 6 pieces equal pieces (about 2.5 oz each). For each piece, separate further into appropriate sizes for the body, head, tail and ears. 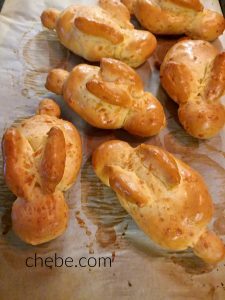 On a baking pan (lined with parchment if available) assemble the body parts to make your bunnies. Be sure the body parts are tight against each other, and you may wish to seal the front ends of the ears to the head by rubbing in a small dab of water at the joints. Make the egg wash by blending one egg with 2 Tbsp water. 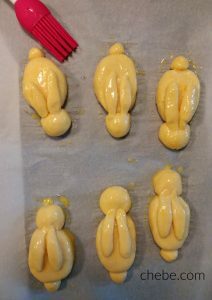 Brush the entire bodies with the egg wash.
Bake 20 minutes until golden browned. Serve warm and enjoy. 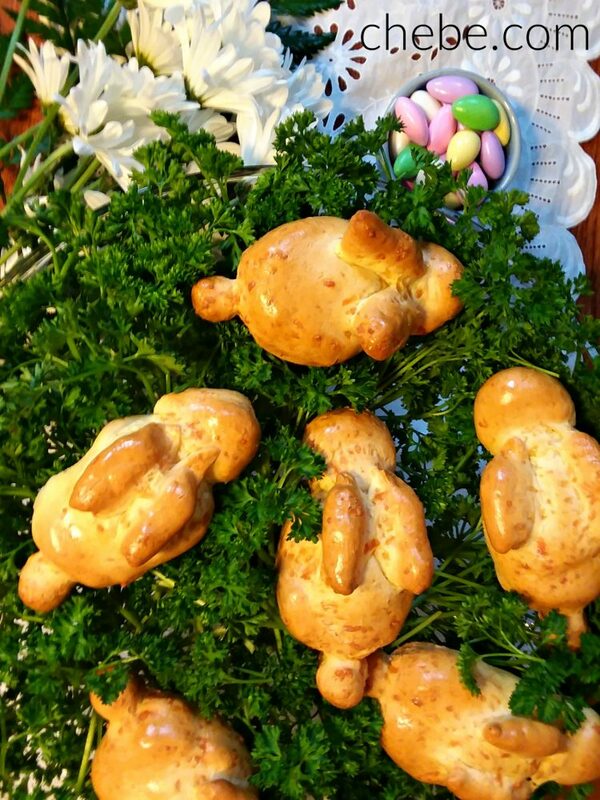 We recommend egg wash because it helps to seal all of the bunny pieces together. The ears are the part most likely to separate from the head, so we also recommend a little dab of water worked in with your finger at the point where the ear meets the head. This helps to paste the two pieces together. Parchment paper is nice if you have it handy, but it is not required. 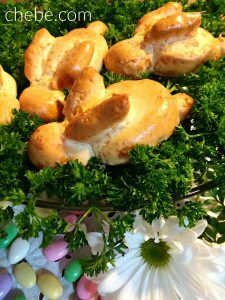 You may freeze the bunnies (stored in an airtight container) and reheat in a hot oven (450F) for 7-8 minutes. A toaster oven works well for this.